Fire Place Safety can help your aging parents stay safe this winter. You'll want to hear nothing but happy stories about evenings in front of a cozy fire. Prevent burns, injury, falls or worse by helping them follow these tips. Always open the damper BEFORE lighting a fire and keep it open until the ashes are cold. Otherwise, the smoke will accumulate very quickly and take a very long time to disperse completely. The toxic fumes of the smoke (including carbon monoxide) will invade the whole house and can quickly cause breathing problems for older adults. Make sure the chimney drafts properly. For fire place safety, check to see that the chimney will draw up the fire and smoke. Your parents can test this by taking several sheets of newspaper and rolling them up. Then with the fireplace damper in the open position, light the newspaper in the fireplace. The smoke should rise up the chimney. If it doesn't, you have an obstruction and need to call a professional in to clean the chimney before use. Your folks should be extra cautious when carrying logs. Give them a smaller holder that will only hold one or two logs as your parents' strength may be diminishing with age. Make sure you remove small throw rugs or other tripping hazards along the path where they may carry logs. Home rolled newspaper logs can be used safely. For starters, never dowse them or soak in flammable fuels of any kind. You can never know how much was really absorbed, and the risk of explosion is just not worth it. Soaking the newspaper in water either before rolling or during rolling removes the clay content of the paper, and will make the log burn better. Then, the logs could be stacked on end and dried for a couple of weeks in a basement or garage. Then use the newspaper logs, with kindling just as you would for a regular fire. Pellet Stoves, Pellet Fireplace Inserts - Only use the fuel that the manufacturer has indicated. For wood stoves burn use only seasoned (aged) wood, not green wood, artificial logs or any trash. For burning firewood in wood stoves or in you'll want to fireplaces, select only well-seasoned wood that has been dried for a minimim of six months to a year and stored properly. All firewood should have been seasoned for six months, by then, the "moisture content" will be about 20 percent. Well-cured wood is grayish on the end, with radial cracks. This is best for an efficient burn and the least smoke. If you do buy small pre-wrapped bundles of wood at the grocery store, a gas station for instance, open the package and let the wood dry out before you use it. Wood wrapped in plastic will probably be too moist to burn at its best. Do not use coal or charcoal in a fireplace because because of the danger of carbon monoxide build-up. 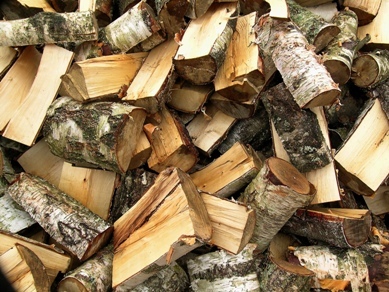 For other Firewood Tips see this fireplace blog from Consumer Reports. Artificial logs are NOT the same as real logs. Many artificial logs are really coated with wax that is holding together sawdust treated with special chemicals. Follow the burning instructions exactly as written because these logs can burn hotter and behave very differently than actual wood logs. They are designed to be burned one at a time. You have to start when the fire place is cold and artificial logs should never be added to an already burning fire or on top of burning wood -- they can flare-up and explode. Also never use a fire poker with artificial logs for the same reason. The non-wax variety of manufactured firelogs tend to be safer and better for the environment. Never use gasoline, charcoal lighter or other fuel to light or relight a fire. The vapors themselves can ignite. For fire place safety, never keep those flammable fuels anywhere near a fire. Vapors can quickly travel the length of a room and explode.